ArcGIS integrates imagery from both countries, resulting in full coverage for the entire boundary. The GIS includes several custom forms and toolbars to assist field-workers. GIS is a common language and a shared framework for interpretation, regardless of national sovereignty or borders. The Canada-United States boundary represents more than 100 years of collaboration to maintain the longest shared border in the world, from the Atlantic to the Pacific to the Arctic. Since 1908, both countries have appointed an expert geographer or surveyor to lead the International Boundary Commission (IBC) in maintaining an accurate boundary, consisting of a 20-foot cleared vista marked by more than 8,000 monuments. The Canada-United States boundary represents over 100 years of IBC collaboration and consists of a 20-foot cleared vista marked by more than 8,000 monuments. "The average citizen would be pretty amazed to learn that there's actually a lot of work that goes into maintaining a boundary," says J. T. Moore, lead engineering technician for the US section of IBC. "When most people think of the US-Canada border, they say, 'If you know where the line is, why do you have to go out there and take care of it?'" As defined in the treaty that established IBC, Canada and the United States are mandated to maintain an effective boundary to ensure safety and security and prevent local misunderstandings while being open to tourism and trade. IBC says this effort is as essential today as it has been throughout history for effective law enforcement, land administration, customs and immigration, and the management of transboundary resources. To maintain the boundary, IBC field party chiefs work with seasonal field crews, which may consist of woodsmen, machine operators, and masons, as required to keep the vistas open and the boundary monuments in good condition. Some of the original monuments were made of separate pieces so workers could transport them to remote locations by foot, mule, or horse. Today, remote border points are marked with stainless steel monuments installed via ATVs, canoes, and occasionally helicopters. The work often involves camping out for extended periods and spending weeks at a time on boats to maintain reference markers. Water boundaries are marked when possible, but in most areas, such as the Great Lakes, freezing conditions make it impossible. Unlike the US-Mexico boundary, the US-Canada border is never determined by geographic features such as bodies of water. Land boundaries have specific coordinates, and water boundaries are defined by a series of straight lines and turning points set in reference to monuments on the shores. Over the last 100 years, some rivers and streams along the boundary have shifted due to both natural and human forces, such as alterations made by loggers to better transport lumber. 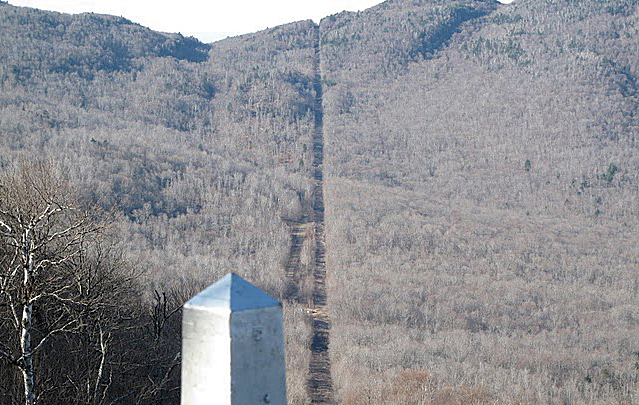 For example, the boundary that once followed the course of Halls Stream between Quebec and New Hampshire remains fixed, but because its course has shifted gradually, IBC now maintains a cleared vista with monuments in some areas near the stream. In 2007, the Canadian section of IBC took the lead in creating a GIS using ArcGIS for Server, working closely with Esri to build a geodatabase that will work for both countries. The project involves compiling thousands of coordinate values, paper maps, and surveyors' field notes into a manageable, searchable, shareable system. Using the new GIS, IBC is increasing accuracy and efficiency in many areas, from calculating vegetation growth to determine optimal maintenance cycles to having quick access to landownership records so staff can inform residents of surveys and monument maintenance. The GIS includes several custom forms and toolbars developed with Esri Canada Limited that enable field-workers to report survey data, work completed, photos, and other information related to their visit to a boundary point. It also leverages the ArcGIS 10 for Server Image extension to compile data supplied by agencies in both countries, resulting in full imagery coverage for the entire boundary. Bridging the gap—Example of harmonized hydrographic data between Canada and the United States compiled by the International Joint Commission. "Our imagery is high resolution, so we can see how things are growing, how things are changing, and what's exactly on the vista in certain areas," says Moore. Considering the legal and safety issues involved where boundaries meet, IBC has an ongoing relationship with the US Border Patrol and the Royal Canadian Mounted Police. With the boundary data in a GIS, IBC will be able to provide government officials with more accurate data that they can apply in their own systems to better track and manage incidents and take informed precautionary measures. "The maps you see from organizations like the US Geological Survey or Natural Resources Canada will stop at the US-Canada border," says Moore. "We are mapping both sides of the boundary, and because IBC is the only agency that provides official maps of the boundary, this has a big implication for law enforcement on both sides." Roughly 40 percent of the US-Canada border is covered in water, making the impact of either country's environmental policies inescapably intertwined. Under the Boundary Waters Treaty of 1909, the United States and Canada established the International Joint Commission (IJC) to help prevent and resolve disputes about the use and quality of boundary waters and to advise both countries on water resources. IJC's many boards and study groups bring together stakeholders at the local level in an effort to examine and resolve problems before they become national or international issues. Along the Red River, for example, representatives from Minnesota, North Dakota, and Manitoba serve on the International Red River Board of Control to ensure communication regarding anything that involves this sensitive water system. In recent years, government organizations and conservation groups from both countries have advocated an even more holistic international approach to managing and protecting the vast watersheds they share. As an important step toward a more collaborative conservation effort, the United States and Canada are in the process of harmonizing and evaluating boundary water data. 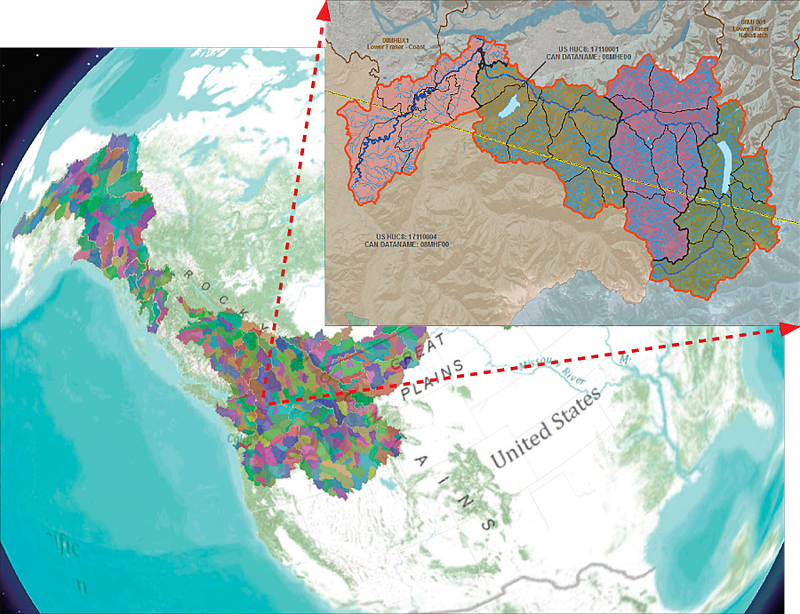 Beyond tracking the location of the international boundary, which is provided by IBC, this project involves sharing hydrographic datasets essential to managing and modeling future impacts to these water resources. It is being undertaken by a transboundary hydrographic data harmonization task force headed by IJC and composed of representatives from Environment Canada, Agriculture and Agri-Food Canada, Natural Resources Canada, the US Geological Survey, and the US Environmental Protection Agency. The harmonization process is being carried out by GIS professionals at a US Geological Survey office in Salt Lake City, Utah, and an Agriculture and Agri-Food Canada office in Winnipeg, Manitoba. Says Michael Laitta, GIS coordinator for IJC, "This was the first time that an outside organization such as the IJC was able to bring the pertinent technical and administrative people to the table to address these data disconnects that these stewarding agencies really didn't have the mandate to address. The IJC is acting like a bridge. We're enabling agencies to have a constructive discourse and interpretive interactions with their sister organizations. The task force enables us to work at the federal level. Everyone involved is changing their data based on our recommendations to reflect what is really happening on the landscape between US and Canada." While both nations had already made concerted efforts to compile accurate data as new technologies were introduced, there were many discrepancies, and each had developed different standards. From Maine and New Brunswick to Yukon and Alaska, there were substantial differences in drainage density, toponomy, and even the names of bodies of water. "By harmonizing our data, we're removing administrative brick walls," says Laitta. "We can provide state, provincial, and local governments, as well as our IJC boards, with a fundamental geospatial structure upon which to hang all sorts of water quantity models, water quality models, ecosystem evaluations—you name it. Most importantly, we're using GIS as a fundamental common language and a shared framework for interpretation, regardless of national sovereignty or borders. Esri tools have enabled us to do that. The questions governments ask are inherently geospatial. They are associated with an area, not a point." As geospatial technology is becoming more prevalent and accessible, IJC is leveraging ArcGIS to offer a collection of international datasets online, giving local governments and the public access to detailed, authoritative information about a variety of factors along the boundary waters. Thanks to this binational, multiagency collaboration, data users in Canada and the US can now access elements of these harmonized datasets through the USGS National Map and the Canadian GeoBase. The ability to provide seamless, binational data at such a meaningful scale is unprecedented and marks a major milestone in 60 years of data development by the US and Canada. For more information, contact J. T. Moore, lead survey engineering technician, US section of the International Boundary Commission (e-mail: moorej@ibcusca.org); contact Michael T. Laitta, physical science adviser/binational GIS coordinator, International Joint Commission of Canada and the US (e-mail: laittam@washington.ijc.org); or visit www.ijc.org.